Indian restaurant in Borough, near London Bridge Station. They're not licensed, but you can BYOB. According to an advert in the June 2009 issue of Southwark Weekender, they have a lunch buffet Monday-Friday which costs £6. They also do takeaway and delivery, and you can order online from Just-Eat. Kake and bob tried the delivery option a couple of times in April 2009. Both times, the food arrived hot and on time. Our total bill the first time was just over £30 for what would probably have been nearly enough food for three people. Salmon samosas (£3.15 for two) were fine, but meat samosas (£2.10 for two) contained several thin slivers of onion skin. Memsahibs lacy cutlets (£3.15 for two) had decent-size chunks of meat but were a bit mushy. Chingri puree malai (spicy prawns served on soft fried flatbread, £3.25) was a fairly standard rendition with nothing particularly wrong with it. Cafe Nawaz special masala (chicken with minced meat and "oriented" spices, £6.50) and bagari gosht (Hyderabadi lamb with fresh coriander, £5.25) were both very generous with the meat content, and the sauces were well-flavoured. Tarka daal (£2.35) was a bit salty. Bhindi bhaji (£2.35) was quite lemony, which worked well; however, the second time we ordered it, it had several inedibly-stringy bits. Saag bhaji (£2.35) and baingan bartha (£2.35) were both a little bland. Plain rice (£1.90) was fine. Kake's verdict: I was quite pleased with our first order, as the quality was pretty good for the price. However, our second order was more disappointing. I might give them another chance some time. Food last sampled by Kake and bob, April 2009. 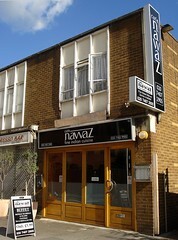 Opening hours taken from the Cafe Nawaz website, March 2011. Last edited 2014-03-22 17:50:00 (version 8; diff). List all versions. Page last edited 2014-03-22 17:50:00 (version 8).